Genial, auch ohne Touch? Die neuen MacBook-Pro-Laptops sind da. Markantestes neues Feature: die Touch Bar anstatt der Funktionstasten. Nichts desto trotz bietet Apple auch ein Modell ohne diese Neuheit an, und will damit den "Einstiegsbereich" bedienen - Preispunkt: 1.699 Euro. Wir haben bereits ein Gerät vor Ort und werden hier in Form eines Live-Tests nach und nach unsere neusten Erkenntnisse teilen. Lange mussten die Fans der Notebooks aus Cupertino darben, doch dann kam Apple gleich mit drei neuen Geräten um die Ecke. Jedoch: Eine rein auf USB Typ C basierende Port-Austattung, CPU-Leistung auf Vorjahres-Basis und eine komplett neue Tastatur – kann das gut gehen? Die Antwort lautet: Ja, sogar exzellent. Das MacBook Pro ist rasend schnell, USB-C sehr vielseitig und die Tastatur nach Eingewöhnung hochpräzise. Das ganze gibt’s im schicken Aluminium-Gehäuse schlanker denn je. Wer kann da noch nein sagen? Tempo: „Beim Arbeiten richtig fix, Spiele ruckeln etwas, sehr hohes USB-Tempo.“ (1,71); Bild und Ton: „Top-Display: sehr scharf und kontrastreich, genaue Farbwiedergabe.“ (1,90); Mobilität: „Top: Bleibt kühl und hält bis zu 7 Stunden durch, im Normalbetrieb superleise.“ (1,47); Ausstattung: „Lässt sich nicht aufrüsten. Nur zwei USBC-Buchsen, schnelles ac-WLAN.“ (3,57); Bedienung: „Sehr großes und präzises Touchpad, komfortable Tastatur mit sehr kurzem Hub.“ (2,25). Kommt darauf an: In keinem Bereich bietet Apple ein echtes Killer-Feature, welche das MacBook Pro 2016 mit 13 Zoll deutlich vom Vorgänger abgrenzt. Behutsame Detailverbesserungen stehen auf dem Programm. Ob das den hohen Preis wert ist, muss jeder für sich entscheiden. Einen wirklich spürbaren Unterschied bieten nur die sündhaft teuren 15-Zoll-Geräte mit OLED-Touchbar. Was macht das MacBook Pro zum MacBook Pro? In der Vergangenheit waren es vielfältige Anschlüsse inklusive SD-Kartenleser und Prozessoren sowie Speichersysteme mit außergewöhnlich hoher Leistung: 28-Watt-CPUs in 13-Zoll-Notebooks gibt es quasi nur von Apple. Das um Touch Bar und Touch ID beraubte MacBook Pro bietet davon nur die extrem schnelle SSD. Nägel mit Köpfen: Das MacBook Pro ist kein Must-have! Ja, es ist leicht, hat einen tollen Bildschirm und ist unglaublich dünn. Aber es ist auch teuer. Unser Testgerät kostet 2.699 Euro. Dafür bekommt Ihr ein MacBook Pro, dass sich aktuell nur bedingt für professionelle Anwender eignet: Kameramänner, Fotografen und Co. sind auf Standard-Steckplätze und einen SD-Karten-Reader angewiesen. Das brandneue Apple MacBook Pro 13,3 Zoll deklassiert im Test die komplette Konkurrenz und platziert sich damit auf der Spitzenposition unserer Bestenliste. Zu verdanken ist dies dem erstklassigen Display, langen Laufzeiten und solider Performance. Einige Schwachpunkte stellen wir allerdings vor allem bei der Ausstattung fest. Allerdings fehlt es dem MacBook Pro an der nötigen Reife. Die Situation erinnert an die Apple Watch, die erst seit watchOS 3 ihr ganzes Potenzial ausspielt. Oder an die 3D-Touch-Technik im iPhone 6s: Sie war bei der Einführung eher eine Spielerei, bis sie ein Jahr später mit iOS 10 durchstartete. Portabler, aber reicht dem Profi die Power? Das MacBook Pro kostet viel und bringt viel. Einige Nutzer hätten sich ein pro-mässigeres MacBook gewünscht, für die grosse Masse scheint das Paket aber zu stimmen. Der Neuling ist kurz nach Verkaufsstart schon das erfolgreichste Notebook des Jahres. Wenn euch das neue MacBook Pro 13 mit Touch Bar preislich zu hoch erscheint, könnt ihr bedenkenlos zum Modell mit klassischer Funktionsleiste greifen. Das aufgefrischte Aluminium-Gehäuse, ein helleres Retina Display, die schnelle SSD und die neuen Eingabegeräte teilt sich die gesamte MacBook Pro Familie. I know what I’m doing more with Windows than with a Mac. But I must say that this entry level 13 inch MacBook Pro makes the thought of switching extremely tempting. If you're looking for the best all-around MacBook in the 2016 lineup, you should definitely get the one that has an updated Retina screen, fast Intel Core i chip, plenty of pots, and a great keyboard. The problem? This laptop doesn't exist. While it's not too late to pick up a 2015 MacBook Air that comes close, our ideal MacBook continues to be imaginary. More than laptop evolution, the 2016 MacBook Pro Touch Bar is computing revolution, and not just because of its innovative new input option. Yes, the OLED strip is a brilliant way to speed up whatever you're working on, but it's still early in its evolution cycle. There are already dozens of programmes that support it, and this figure is only set to grow. What really wows though, is how the whole package works together. I think the easiest way to think of the new MacBook Pro notebooks is this: if you don’t mind the ports and the high price, then the new MacBook Pro notebooks are one of the best notebooks you can buy. It’s fantastically well made; it has a wonderful display, keyboard, and trackpad; and it offers really great performance for a 13-inch notebook with no discrete graphics. So the main question, is the new MacBook Pro worth its premium price tag? To be honest, I’m a little bit split. For a starting price of $1,799 for the base model, you want to be sure you need the upgrade. 80% MacBook Pro 13-inch (Touch Bar) Review: Is It Good for Business? That doesn’t mean there’s not plenty of potential for a small, full-color display that leaves your primary screen uncluttered and allows you to manipulate tools with one hand while you use the trackpad with the other. Just as Thunderbolt 3 needs time to gain traction, so the Touch Bar is dependent on third-party support and imagination to really come into its own. Life on the cutting edge is, inevitably, something of a gamble as you wait for everyone else to catch up. There's lots to like about the new MacBook Pro: its slimmed-down design, brighter screen, improved audio, faster graphics and disk speeds. But by doing things like removing full-sized USB ports, the memory card reader and even the Function row, Apple seems to forgotten how many of us actually work. An even better MacBook Pro would be one that doesn't require users to make drastic changes to their workflow. Such a MacBook would be the modern-day descendant of the one that Steve Jobs put in the consumer/portable quadrant of his 1997 grid. Did I mention you can't make everybody happy with one kind of computer? New Apple MacBooks: Are You Not Entertained? The new MacBooks announced the week before last were conservative except for the new Touch Bar. Don’t read conservative as easy. We must at the same time acknowledge, though, that like the iPhone 7, Apple changed almost everything with the new MacBooks. So how can you change everything and be conservative? Aside from Touch Bar, we had seen the Trackpad, keyboard, WiFi, Bluetooth and display core technologies in prior products and Intel’s Skylake notebooks have been shipping over a year. Would I choose this model over the new MacBook Pro models with the Touch Bar and Touch ID? If money was no object, probably not. But if you’re a MacBook Air user (or were considering buying a MacBook Air), money will probably be relevant. This model is a tweener, to be sure, but it’s got a lot more than the MacBook can provide without the higher price tag of the Touch Bar models. Surely there’s a sweet spot there. Yes, I know that Apple’s prices have gone up across the board, but it’s far from the only tech company to make such a move, and when I look at what else you can get for similar money to this entry-level MacBook Pro I don’t see a great deal of temptation. Sure the Surface Book will tick more boxes for a certain type of user, but I’d say that this is the more universal device. I know one thing’s for sure: it’s going to feel like a big step back in time when Apple comes to collect this new MacBook Pro and I’m left with the chunky, ungainly 2015 model that I was still in love with just a few short days ago. Given its size, this entry-level MacBook Pro feels like as much of an overpowered MacBook Air replacement as a halfway house between the MacBook and Touch Bar-packing Pros. The lack of the Touch Bar is a bit of a shame, sure, but this machine serves a purpose in its own right. Apple and its fans would have you believe that the decisions made are common sense and of course this MacBook Pro is going to be suitable. Others will be convinced this has damaged the brand and usefulness of the laptop. The truth will lie somewhere in between. The new MacBook Pro is as beautiful and desirable as ever, but using it is alienating to anyone living in the present. I agree with Apple’s vision of the future. I’m just not buying it today. Overall, the MacBook Pro is impressive, with improved screen quality and battery life over the previous model, and its use of 6th Generation Intel processors helps boost performance as well. Troubling though, is the move to USB-C/Thunderbolt 3 and the removal of on-board ports for Thunderbolt 2 and USB 2.0/3.0 (Type-A) devices. On the bright side, other PC makers are adopting USB-C and Thunderbolt 3, so many more compatible peripherals will be available soon. But should you buy one? 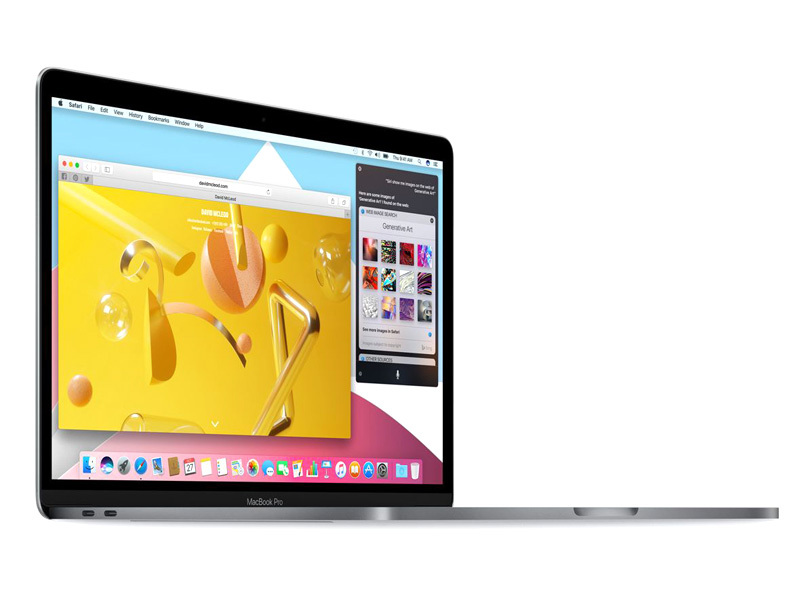 The 13-inch MacBook Pro improves upon its predecessor in nearly every way. It’s faster, lighter and more compact, and it offers a brighter display and considerably longer battery life than most Windows machines. I also like the rich and powerful stereo speakers. However, while I’m glad Apple included 2 fast Thunderbolt 3 ports, I wish it kept a traditional USB 3.0 port around for charging the iPhone and connecting other peripherals, as well as an SD card slot. On the upside, even though I don't think anyone thought that the already very slim outgoing Pro models needed to be even skinnier, this is a very good looking and portable machine. Materials, build and aesthetics are top notch. The display is one of the best I've seen on a 13" laptop, and it has low reflectance even when not set to high brightness. Performance is fine, though it's not faster than competing 13" Ultrabooks in the $1,000 tier (though storage is faster than most). Though the lack of currently popular ports is a problem, it's great to have two forward looking Thunderbolt 3 ports (though 1 is occupied by the charger). On the more expensive model, the 4 ports feel just about right. The entry-level MacBook Pro delivers a flagship laptop design from Apple that many will be happy with, without getting caught up in the new Touch Bar and Touch ID option. The looks, design, new keyboard and trackpad are all lovely. The screen is delicious too, certainly in comparison to the MacBook Air, making this a great entry-level (if you can say that for a £1449 laptop) machine. MacBook Pro (2016): Is It Good for Business? As previously mentioned, you get a Touch ID fingerprint reader on all Touch Bar-equipped models, which will give workers a nice security boost. Additionally, the trackpad has been scaled up (it's huge), and the keyboard has been updated to Apple's second-generation "butterfly switch" buttons. Exceedingly slim laptops don't always provide a great typing experience, though, so we're eager to put the slim new MacBook Pro's layout through its paces. Adding the Touch Bar is a more innovative move. It gives Apple MacBook Pro users greater touch control they are probably used to without making the entire screen one big touch screen like the iPad. That was something that Steve Jobs always said was a big "no, no". But by adding touch elements that change an adapt, the laptop becomes a lot more intelligent, and smudge free. 100% 13-inch MacBook Pro review: is this the power laptop to beat? The 13-inch MacBook Pro with Touch Bar and faster processor – and more USB-C ports – will go from $1,799 (approximately RM7,565), while the beefier and bigger 15-inch model retails from a whopping $2,399 (around RM10,090). The most affordable 13-inch MacBook Pro will start shipping today in the US, while the two higher-end models will only be available sometime in the next two to three weeks. Positive: Nice design; good built quality. Negative: High price. Nadie entiende el MacBook Pro. Yo tampoco. Positive: Compact size; great built quality; excellent display; comfortable keyboard; long battery life. Negative: No memory card slot; high price. Positive: High autonomy; high mobility; high performance. Negative: High price. Positive: Good ergonomy; impressive touch bar. Negative: High price. Positive: Lightweight; good cooling system. Positive: Impressive touch bar; excellent display; long battery life; good hardware. Negative: High price. Positive: High performance; excellent display; impressive Touch Bar. Negative: No SD card reader; high price. Positive: Slim size and lightweight; excellent display; high autonomy. Negative: High price; few ports. Positive: High autonomy; compact size; excellent speakers; smart touch bar. Negative: High price. Positive: Slim size and lightweight; good display; high autonomy; flexible fingerprint sensor. Negative: High price. Positive: Compact size; long battery life; excellent display. Negative: High price; few ports. Positive: Great display; long battery life. Negative: Mediocre keyboard. Apples upgedatetes MacBook Pro 2016 ist, wie auch bei der Vorgängerversion, in zwei Größen erhältlich: in 13 und 15 Zoll. Das kleinere 13-Zoll-Modell ist bis dato Apples bestverkauftes Modell und gilt für viele Hersteller als Vorbild. Das Gehäuse des neuen MacBook Pro 13 wurde dramatisch verkleinert, da es nun 17% dünner als sein Vorgänger ist und Abmessungen von bis zu 14,9 mm und ein Maximalgewicht von 1,37 kg erhalten hat. Da einiges an Gehäusedicke eingespart wurde, mag sich so mancher User nun um ein effektives thermisches Management sorgen, doch Apple hat diese Problematik mitbedacht und zeitweise aktive Ventilatorenflügel verbaut, welche Luft zügig durch das System transportieren können und Hitze leise aus dem Gehäuse befördern. Das neue Pro-Feature ist ein vergrößertes Force Touch Trackpad, welches zweimal so groß ist als im vorigen Modell, und somit mehr Raum für Gesten und Klicks bereitstellen kann. Auch die Tastatur hat ein Upgrade erhalten – der neue „Butterfly-Mechanismus“ ermöglicht eine vierfach bessere Tastenstabilität. Das neue Display des Macbook Pro wurde von Apple als das beste jemals in einem MacBook verbaute Retina-Display bezeichnet. Und dies kann kurzerhand bestätigt werden, da der neue und verbesserte Screen eine hellere LED-Hintergrundbeleuchtung und ein gesteigertes Kontrastverhältnis bietet, und damit tiefere Schwarz- und hellere Weißtöne abbilden kann. Weiters ist es um 67% heller und besitzt eine maximale Helligkeit von 500 nits. Zu guter Letzt wird der weite Farbraum Kunden aus dem professionellen Bereich anlocken. Die abgebildete Farbvarianz ist nun 25% weiter als der SRGB-Farbraum und kann den P3-Farbraum abbilden, was vor allem für Fotografen einen tollen Mehrwert bedeutet. Die jüngste Neuheit an Bord des Notebooks ist die Multi-Touch-Leiste. Dies ist ein verbauter Glasstreifen, welcher in die Tastatur eingelassen ist und die früheren Funktionstasten ersetzt. Situationsabhängig stellt diese Leiste Funktionen bereit, welche für die momentan genützte Software benötigt werden. Der Display auf der Multi-Touch-Leiste ändert sich automatisch und ermöglicht den Zugang zu relevanten Tools wie zum Beispiel zu Systemkontrollfunktionen (Helligkeit und Lautstärke), interaktiven Möglichkeiten der Internetnutzung, intelligenten Tastaturhilfen wie Emojis und Texterkennung. Um auf diese Funktionstasten zuzugreifen, müssen Sie einfach die FN-Taste auf der Tastatur antippen. Potenzielle Kunden sollten dabei allerdings bedenken, dass die Leiste nicht in Einsteiger-Modellen der 13-Zoll-Serie verhanden ist. Ein weiteres Features des neuen MacBook Pro ist der Touch ID Fingerabdrucksensor, welcher dazu verwendet werden kann, um das Notebook in Sekundenbruchteilen zu entsperren und zwischen Usern zu tauschen. Des Weiteren können schnelle und sichere Online Apple Pay Einkäufe mit der Touch ID Funktion getätigt werden. In ihrem Kern tragen die 13-Zoll-Modelle Dual-Core Intel i5 oder i7 Prozessoren. Hinsichtlich Speicherkapazität werden 8 GB RAM geboten, welche auf 16 GB aufgerüstet werden können. Auch eine hervorragende Batterielaufzeit hat das MacBook Pro, da es bis zu 10 Stunden ohne Akkuladung betrieben werden kann. Zweifellos wird das neue Macbook Pro 13 weiterhin das bestverkaufte Modell der Apple Riege bleiben und für viele zukünftige Laptops als Messlatte herhalten müssen. Trotzdem ist der gesalzene Preis ein Dorn im Auge vieler Kunden. Die Modelle mit der Multi-Touch-Leiste kosten bereits so viel wie einige Gaming Laptops mit Windows. Außerdem kommen auch Zweifel auf, wenn man bedenkt, dass in einigen Modellen der ersten Warenlieferung eine fehlerhafte GPU verbaut wurde. Es wird sich zeigen, ob dieses Problem behoben wurde oder auch in zukünftigen Modellen auftritt und ob Apple diesen Schwierigkeiten trotzen kann. Intel Iris Graphics 540: Integrierte Grafikkarte (GT3e), welche in einigen Skylake-CPUs (ULV-Modelle, 15 Watt TDP) verbaut wird. Diese Klasse ist noch durchaus fähig neueste Spiele flüssig darzustellen, nur nicht mehr mit allen Details und in hohen Auflösungen. Besonders anspruchsvolle Spiele laufen nur in minimalen Detailstufen, wodurch die grafische Qualität oft deutlich leidet. Diese Klasse ist nur noch für Gelegenheitsspieler empfehlenswert. Der Stromverbrauch von modernen Grafikkarten in dieser Klasse ist dafür geringer und erlaubt auch bessere Akkulaufzeiten. » Weitere Informationen gibt es in unserem Notebook-Grafikkartenvergleich und der Benchmarkliste. 6360U: Auf der Skylake-Architektur basierender ULV-SoC (System-on-a-Chip) für schlanke Notebooks und Ultrabooks. Integriert unter anderem zwei CPU-Kerne sowie eine schnelle Grafikeinheit mit eDRAM-Cache und wird in 14-Nanometer-Technik gefertigt.» Weitere Infos gibt es in unserem Prozessorvergleich Vergleich mobiler Prozessoren und der Prozessoren Benchmarkliste .